Thank you all for making this month long birthday bash so much fun! I have loved seeing all the wonderful creations and reading all the nice comments!! Special thanks to my Flutter By team and guest designers too....I'm blessed with all of them! The two winners of last week's digi stamp by Christy Croll are Julia and Kim Y! Please get me your email and I will get it right to you!! We are also welcoming back two Flutter By Team members, Kristie and Taylor!! Be sure to visit them and all the rest of the Flutter By team and see their awesome creations and leave them some love--links are on my sidebar! Be sure to stop by Chris' blog and wish her a Happy Birthday too!! This week's blog candy is a mystery!! But I think it will be something fun! In order to be entered in the drawing to win this mystery blog candy, you need to create a card with a butterfly or fairy and either the color sapphire or bling in sapphire (since that's my birthstone)!! What would YOU love to get as blog candy? You have until next Tuesday night, October 6th at midnight (Mountain time zone) to enter. I will announce the winner next Wednesday, October 7th. I'll post my card sometime..I'm having cardmaker block, I sit and stare at my stamps and just can't create...I'm sure I'll be out of it soon!! Thanks for stopping by and have a happy fluttering week! 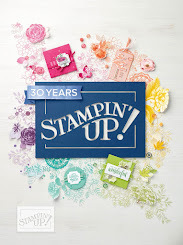 Don't forget that the new Elisabeth Bell for SCACD and Victoria Case for SCACD stamps are available NOW at Susana's ....make sure you order yours...they are too wonderful to pass up!! Danni, our card is so very cute. Love the colors. Wowzers Anna´s card is awesome, sheer beauty. A beautiful card from Anna and a spectacular month for your birthday, Danni!! Thanks for all of the fun! Anna's card is beautiful, Danni! Have a great day!! hugs! Thanks so much for all the fun and for the gifts for everyone for YOUR birthday month! It's been a blast!!! Anna's card is beautiful!! Isn't it so sweet that she used the image from SCACD that was created in your honor! It has been a fun month!! Thanks! I posted my birthday blog candy today since I am on the tail end of the month. I won? Woohoo!! Thanks, Danni! Danni this is so pretty! Love all the little touches. The pink twine, the spots of glitter, the piercing. Really pretty. yayyyyyy! i made it. thank you danni for your patience and for a fabulous birthday party! may your 40's be the best ever! I hope your block leaves soon. Missed seeing a creation from you! Anna's Card is totally Awesome!!!! I love it just gorgeous I have to stop by and let her know how great it is!!!! I have enjoyed the month long Celebration too and I consider it an honor to be part of your team and to be a part of this great group of ladies!!! You ROCK!!! One of these day I will get the card I made just for you in the mail too!!! How long do you have to be fashionably late to send a Birthday card to a friend??? Danni - thanks for the wonderful celebration! It's been a blast! I hope you've had a great birthday - I mean I don't know a lot of people that celebrate all month and with as many people as you :o) You are a wonderful talented person I wish you continued happiness and success - Happy birthday my friend! What a cute card that Anna did. Thank you so much for sharing your birthday month with all of us. It's been so much fun! I've really enjoyed celebrating with you and all your friends. All the best, Danni...you deserve it! Oops, I forgot to answer this week's question...what would I like to receive for blog candy? I'm always just happy to be able to have the chance to win anything! I think it's wonderful to be given that opportunity, no matter what the 'candy' is. What I love the most is seeing all the talent & inspirtation out there. Too me, that's the best blog candy there is! I had fun celebrating your birthday this month too. 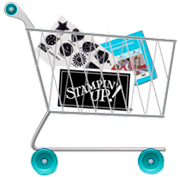 The blog candy that I would like to receive would be a butterfly or fairy stamp of course! Celebrating your birthday month was so fun, Danni! Love your challenges--thanks for having them! Anna's card is gorgeous! She was a great guest designer. I would love to receive some stamped images of Magnolia Tildas for blog candy. Hi Danni..I just booked the pub and DJ for my hubbys 40th Birthday in January. We are in New York for New year as part of his celebrations! 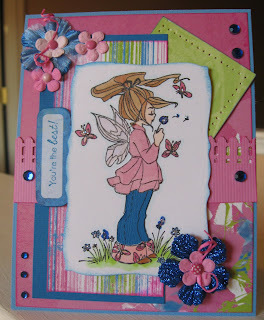 Hope you like my card...and as for blog candy.....pretty buttons, ribbon and charms! Hope you are having fun being 40!! !